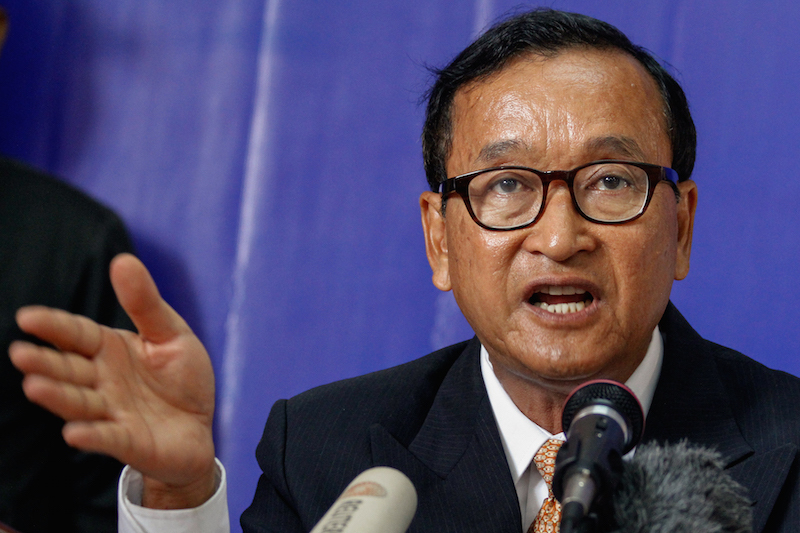 Opposition leader Sam Rainsy resigned on Saturday as president of the CNRP in the face of threats by Prime Minister Hun Sen to pass a law barring convicts from political leadership and dissolving parties led by individuals convicted of crimes by Cambodia’s courts. Mr. Hun Sen promised late last month to draft and pass legal amendments that would make the CNRP vulnerable to dissolution with Mr. Rainsy as its president, given his legal convictions and numerous cases still in the pipeline. 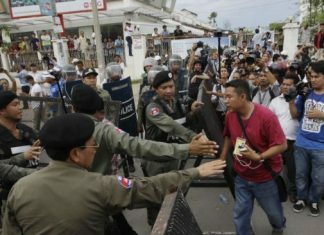 In a letter posted to his Facebook page on Saturday, Mr. Rainsy said that he was resigning as the official opposition leader but still embodied the resistance to Prime Minister Hun Sen.
“Objective: Notice of my resignation from the position as president and member of CNRP for personal reasons,” a signed letter reads. “As stated in the above objective, I would like to inform the permanent committee and steering committee directors about my decision, and consider the decision coming into force from the date of my signature,” says the statement, signed on Saturday. Whether Mr. Hun Sen would actually follow through on his threats to dissolve parties led by individuals convicted by Cambodia’s courts—widely viewed as politicized and corrupt—has been a matter of debate. Mr. Rainsy’s resignation appears to be an effort to make sure his own legal issues will not be used as a pretext to erase his party. The united opposition party was formed with his deputy, Kem Sokha, who has served as its acting president, with Mr. Rainsy banned from returning to Cambodia and living in Paris. CNRP spokesman Yim Sovann confirmed that Mr. Rainsy had resigned as the party’s president but referred further questions to Mr. Rainsy, who could not be reached. The ruling party on Friday said that it was pushing through a new law on political parties, proposed by Mr. Hun Sen earlier this month. The premier said it would be drafted in the model of similar laws in Thailand that have seen parties dissolved after leaders became convicts, often in politically charged cases. Mr. Rainsy decided not to return to the country after a years-old conviction for defaming Deputy Prime Minister Hor Namhong was reactivated despite many believing that he had been pardoned of that conviction, along with others. He has since been the target of numerous defamation suits, most related to claims on his Facebook page about the ruling party.